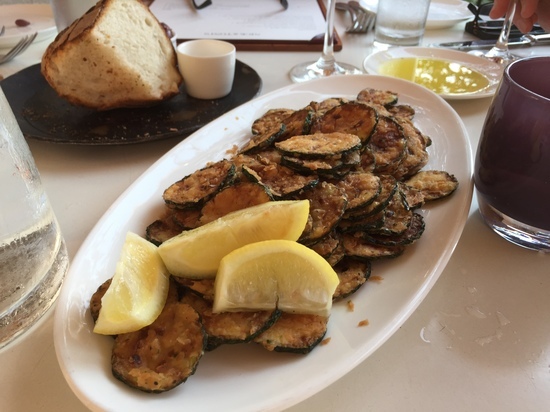 The evening started with our traditional zucchini chips. These lightly coated, thinly sliced orbs were delicious. All they required was a squirt of lemon to elevate the natural goodness of the zucchini. For my appetizer I ordered the beets with goat cheese and pistachios. 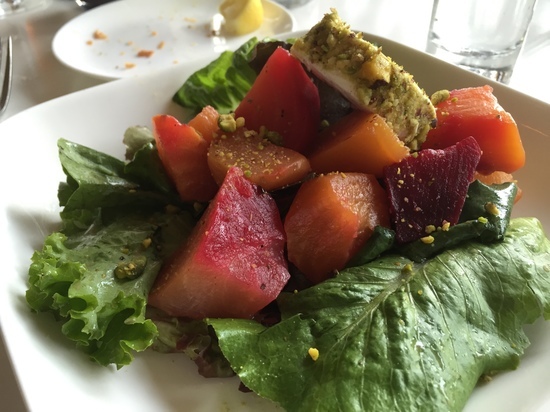 The dish consisted of several quarters of various beets over greens with a slice of pistachio crusted goat cheese. The beets were perfectly roasted to maintain a terrific firmness but fell a little short on flavor, somewhat lacking that deep earthiness. Likewise the sliver of goat cheese was a little meager compared to the ampleness of the beet portion. 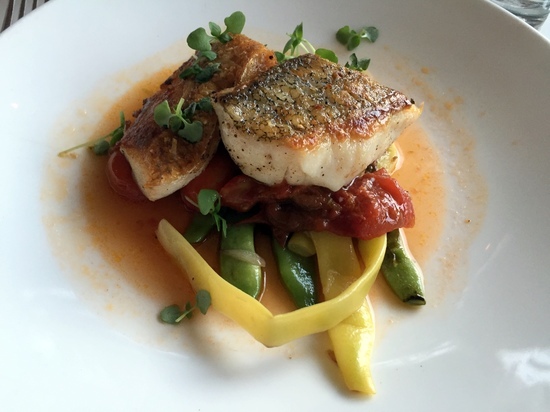 For my entree I opted for one of the night’s specials, tilefish served over pole beans with an heirloom tomato sauce. One word can describe this dish…spectacular. It was my introduction to tilefish and I am now a huge fan of this sweet, firm white fleshed fish. Two fillets sat atop a mound of mixed pole beans, all swimming in a pool of light tomato juice with segments of the tomatoes. The filets were exquisitely prepared with a crisp skin and succulent flesh. The tomatoes and juice added additional sweetness with a smidgen of capers contributing a little saltiness. The pole beans were crunchy and a perfect complement. This was a fantastic and light rendition. To relax after the meal I ordered an espresso. It was one if the deepest flavored espresso I have ever enjoyed. Service was exceptional, professional and spot on in every aspect. Even on a busy Saturday night in August we were not rushed and treated with incredible professionalism throughout the evening. Nick & Toni’s has been a centerpiece of Hampton’s dining for years and there is a reason for it. On this latest visit it proved how great a restaurant can be.